Things, Stuff, Times, Blogs » Inventor of the Telephone? Who’s the inventor of the telephone? My friend Marco, quite the proud Italian, clued me into this caveat to the usual Graham Bell drivel. 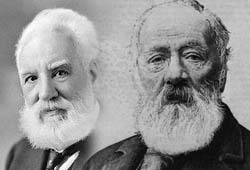 By an act of the US congress in 2002 the true inventor of the telephone is in fact Antonio Meucci an American imigrant from Florence. Of course the Italians really play up the story, and considering Bell’s contraversial views it is not hard to root along with them. Let’s settle this in a fair way. Which do you think has a handsomer beard?